[SatNews] Lockheed Martin (NYSE: LMT) and NASA engineers have successfully welded the Orion spacecraft’s tunnel and forward bulkhead together. The tunnel is the passageway astronauts crawl in and out of when Orion is docked with another vehicle. The forward bulkhead, located at the top of the crew module, must handle extreme loads during re-entry because that is where the parachutes are connected when they deploy. In order to certify the new welding process, the team at Michoud Assembly Facility welded a pathfinder vehicle to verify the design changes and welding changes would perform as expected. 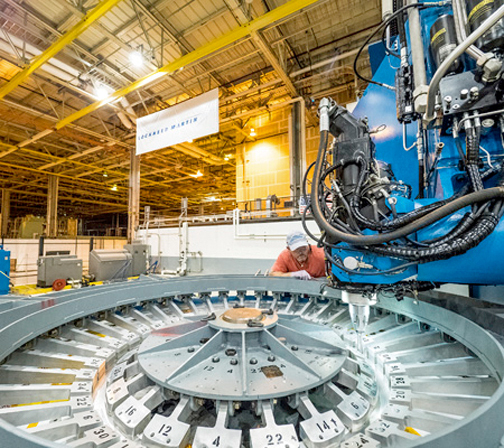 In early 2016, once the pieces that make up the crew module’s pressure vessel are welded together, it will be shipped to the Operations and Checkout Facility at NASA’s Kennedy Space Center. There it will undergo final assembly, integration and testing in order to prepare for Exploration Mission-1 when Orion is launched atop NASA’s Space Launch System (SLS) for the first time. The test flight will send Orion into lunar distant retrograde orbit—a wide orbit around the moon that is farther from Earth than any human-rated spacecraft has ever traveled. The mission will last more than 20 days and will certify the design and safety of Orion and SLS for human-rated exploration missions. “After going through the manufacturing process for the Exploration Flight Test-1 vehicle, we determined we could reduce the vehicle’s weight if we lessened the number of pieces being welded together, as those welded areas weigh more,” said Mike Hawes, Lockheed Martin Orion vice president and program manager. “So, for this next spacecraft, seven bigger pieces are coming together, instead of the eighteen for EFT-1, which makes the welding process a little more challenging than before."